Bladeless LASIK is a refractive treatment surgery which treats surgical procedures of common vision problems such as farsightedness, nearsightedness, presbyopia, and astigmatism. 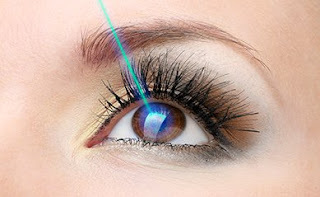 Bladeless LASIK is also known as all laser LASIK or IntraLase. This LASIK surgery is different to other LASIK surgeries as this surgery is created flap by using a laser opposite to a manual blade. Bladeless LASIK is boon for the people with thin corneas as these people are not suitable for the general LASIK treatment due to its precision. Bladeless LASIK has a quality to consistently producing corneal flaps thin enough to treat people with thin corneas and an outpatient procedure. Lasik means laser assisted in-situ keratomileusis eye surgery that achieve 20/25 vision or better that is good for most eye activities. This technique is reducing the individual dependence on eyeglasses or contact lenses. The eye surgeon is capable to develop a tiny flap in the patient’s cornea, with the support of femtosecond computer technology. The laser operates at extremely high speed and permit tissue to be targeted and divided at the molecular level without heating or impacting surrounding tissues, with the control of the computer. The bladeless laser treatment creates corneal flap in much more precise manner in comparison to the traditional microkeratome blade. Further, a standard laser is used to make the appropriate adjustments. The surgery commonly takes less than five minutes and a painless process. Bladeless LASIK surgery supports surgeon to provide a more accurate and flap on the eye that will fall back into place naturally. The difference in flap structure created by the bladeless laser may reduce the chance of cells growing underneath and pushing up the flap (epithelial in-growth) to create an irregular corneal surface with accompanying vision defects. Sometimes, bladeless laser show light sensitivity as a side effect, but it can resolve soon. LASIK surgery also gives rare complications such as dry eyes or temporary visual disturbances. The bladeless laser surgery is as specific treatment facility and totally depends on the recommendation of the eye surgeon. Amrit Hospital, Chennai has a good track record in bladeless Lasik surgery at chennai . The hospital has a good team of doctors. The hospital has a patient centric approach and friendly environment and offers best bladeless Lasik Surgery in Tamil Nadu.